Chrysostom resisted, pleaded. The Imperial messengers were deaf to his pleas. They had their secret orders. He was coming with them whether he wished it or not. Outside Antioch they transferred him into a royal chariot and rode for Constantinople. There, in the capital of the Roman Empire he learned the truth. He was to be Bishop of the imperial city, a position he never wanted but for which many others were fiercely vying. His heart must have sunk as he realized that the other candidates would form implacable resentments against him. But what could he say? The imperial apparatus had brought about his elevation and he was helpless before it. History must play itself out. He would preach with the same authority as he always had. So on this day, February 26, 398, John Chrysostom unwillingly became bishop of Constantinople. Who was John and why was he in such demand? Born in Antioch, Syria, he had been reared by a widowed mother who taught him Christianity. But John intended to go into law. His mother, trusting God for the outcome, sent him to study with Libanius, the great pagan rhetorician of the day. But John's conscience troubled him. Lawyers must constantly take oaths. His mother had taught him oath-taking was wrong. Furthermore, through the influence of saintly Bishop Meletius, the young man was attracted to Christ. Less than a year later he rose to special attention. A tax increase threw the citizens of on Antioch into a frenzy. Rioting, they tore down imperial statues. While Bishop Flavian rushed to Constantinople to plead for mercy with the emperor, who was expected to take awful revenge, Chrysostom preached a series of sermons to the terrified populace. As they awaited the imperial decision, death stared them in the face. 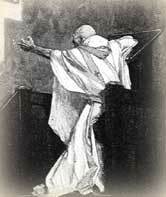 Chrysostom's fierce attacks on sin cut their consciences and many sought the peace of confession and repentance. Fortunately, the Emperor pardoned the city. John's brilliant preaching had made him famous. * His nickname "Chrysostom" means "Golden tongue." Eloquent preaching won him the designation. When the court in Constantinople could not agree on any of the rival candidates for the empty see, the court turned to John. If the people of Antioch had known that John was being taken in 398, they might have rioted again for his straight talk made him popular with them. In Constantinople, Chrysostom continued his attacks on sin, especially on greed and the accumulation of wealth. The Empress Eudoxia became angry when John rebuked her in person for depriving a widow of her vineyard. Eudoxia suspected that John was directing other sermons at her. The emperor also became unhappy with John whom he felt had been raised to his position by court intrigue. The imperial couple teamed up with Patriarch Theophilus of Alexandria to depose John on trumped up charges through a synod of enemy bishops in 403. These enemies exiled John, but the people of Constantinople were so enraged that the terrified empress quickly ordered him brought back. However, when John spoke out against excessive ceremonies in honor of a new statue erected to the empress, Eudoxia became so furious she ordered the bishops to exile John again. This time it was permanent. He died on a forced march that was designed to take him even further away from the court which had made him bishop in the first place against his will. *We are sad to report his sermons, so good in most respects, were sometimes antisemetic. Baur, Chrys. "Chrysostom, St. John." The Catholic Encyclopedia. New York: Robert Appleton, 1914. Bell, Mrs. Arthur. Saints in Christian Art. London: George Bell, 1904. "Chrysostom, St. John." The Oxford Dictionary of the Christian Church. Edited by F. L. Cross and E. A. Livingstone. Oxford, 1997. Pelikan, Jaroslav, editor. The Preaching of Chrysostom; homilies on the Sermon on the Mount. Philadelphia, Pennsylvania: Fortress Press, 1967. Willey, John Heston. Chrysostom: the Orator. Cincinnati: Jennings and Graham, 1906.